I’m back with another Penny Black card using some products from their latest release. I usually create a background like this one with distress inks. But this time I used Kuretake watercolours instead. What I love about these paints is that they are so creamy. I started by wetting some water colour paper with plain water and a paint brush. I then randomly painted on some teals and blues and let the water do the blending. I dried this with my heat tool, before putting some of the watercolours onto my craft mat and adding water to make little pools of colour. I then dabbed the paper into the paint to create the splotches. I did this several times until I was happy with the result. Once the panel was completely dry, I die cut it with the Penny Black Medallion Creative die. I removed some of the die cut pieces and then adhered the rest onto a card base with some liquid glue. The Hello die cut is from the Penny Black Hello Christmas word set. I really love how it turned out. Happy Easter! I have a card over on the Jane’s Doodles blog at the moment. 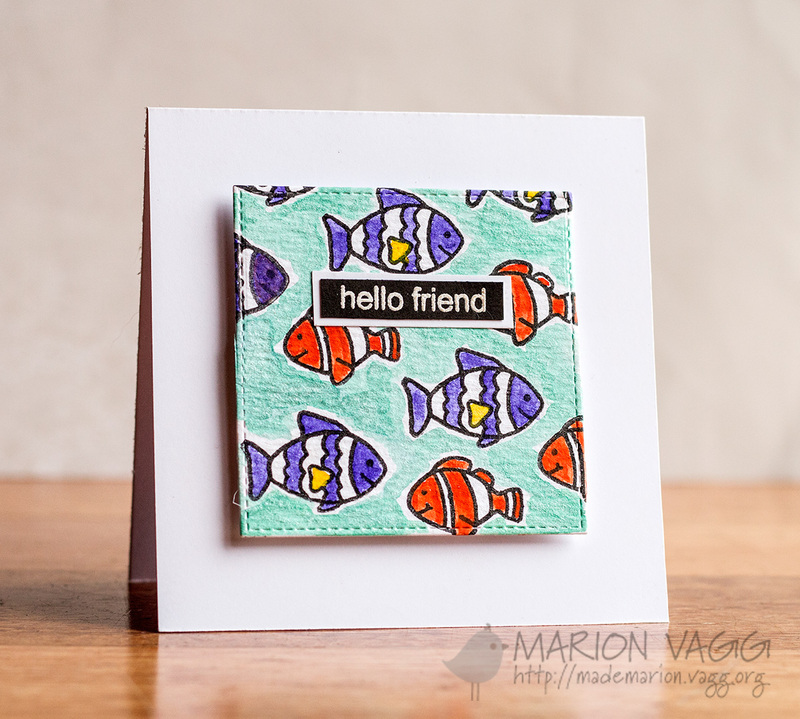 It uses the Under the Sea stamp set and the sentiment is from the Hello Friend stamp set. By the way, Jane is having a sale at the moment – 20% off all stamps. Shop here. After stamping the fish in some waterproof ink, I water coloured the scene using my Kuretake water colour paints. I mixed in some of the white pearlised paint with the aqua paint, and it turned out beautifully. It has a nice lustre and shine to it. Thanks for visiting. I hope you have a blessed Easter. Just popping into let you know I have a new project up on the Simplicity at its Best blog. You can head here for the full reveal. Sadly, today is my last post as a designer for Sunny Studio. I have had a blast being on the Design Team for the last 6 months. I am very thankful to Mendi, the owner and designer of all the Sunny Studio products, for allowing me the opportunity to play and have fun with her super sweet products. This week the team are showcasing the Sunny Borders stamp set. I have used the chevron stamp out of this set to create a fun backdrop for the cute critters out of the Sending My Love stamp set. I just changed up the colours in the chevrons and also the critter. 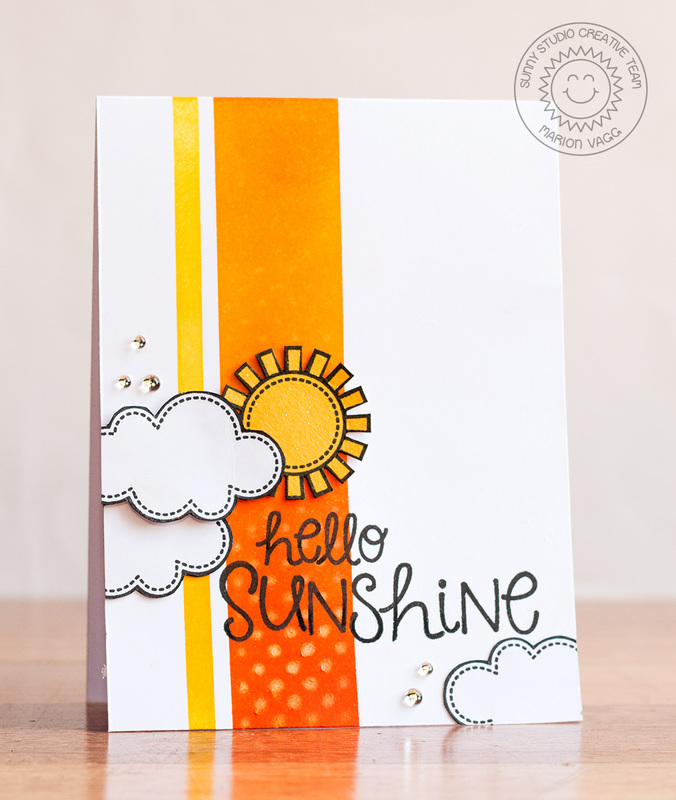 I’ve got 2 cards over on the Sunny Studio blog today. The first one uses a set called Sunny Sentiments. It is one of my favourite sets – it has some greats fonts. I masked off a strip and blended in some distress inks. To create the dots, I used a stencil and removed some ink with a baby wipe. This second card was really fun to make. 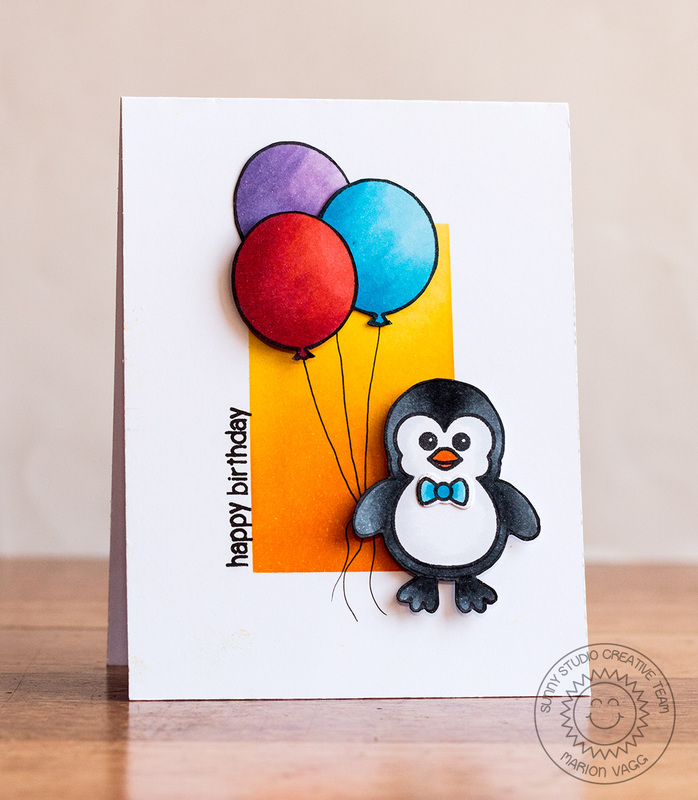 I had fun mixing and matching different sets – Birthday Smiles, Bundled Up and Sending My Love stamp sets.